In a letter to President Abdulla Yameen, former Defence Minister Mohamed Nazim has appealed for open and public hearings in an ongoing illegal weapons trial. The retired colonel alleged his charges were based on fabricated evidence and said he has no confidence that Prosecutor General (PG) Muhthaz Muhsin would uphold his constitutional rights. Article 223 of the Constitution states the PG must assess evidence presented by investigating bodies before pursuing charges, oversee legality of preliminary investigations, and review the circumstances and conditions under which any person is arrested or otherwise deprived of freedom prior to trial. “I cannot depend on the Prosecutor General to uphold his constitutional responsibilities. Hence, I believe the only means to ensure my rights are defended is a just trial open to the public,” he said. Nazim was arrested on February 10 on treason and terrorism charges after police discovered a pistol and three bullets in the then-defence minister’s bedroom during a raid on January 18. At a first hearing on a separate illegal weapons possession trial, state prosecutors alleged Nazim had conspired with opposition leader Gasim Ibrahim’s Villa Group to harm senior government officials, according to documents found in a pen drive confiscated during the police raid. Some of the documents are to be kept confidential, state prosecutors have said. Nazim’s lawyer Maumoon Hameed has described the move as one that would obstruct the former minister’s right to a free and fair trial. 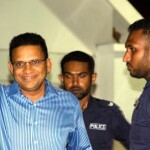 The Criminal Court at a subsequent hearing cited national security reasons, and ruled Nazim be held in police custody until the trial’s conclusion. In today’s letter, Nazim offered to bear the expense for a public trial at the Dharubaaruge Convention Center in Malé if the state was unable to do so. 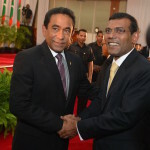 He noted the state had held public trials at Dharubaaruge over the 2003 Maafushi Jail custodial deaths and the 2005 terrorism charges against former President Mohamed Nasheed. The largest courtroom at the Criminal Court, used for Nazim’s trial, only accommodates twenty members of the public, including journalists. Pointing to the thousands of opposition supporters who had marched on the streets of Malé on February 27 urging President Yameen to release all political prisoners, Nazim said a public trial was in the public interest. “Nazim never expected to be where he is now. But he has fallen foul of a political conspiracy, one in which powerful forces within the Maldivian government have sought to destroy him and thus prevent him from challenging for the leadership of the ruling party,” Nazim’s family explained in a letter to the international community. The Maldives Police Services have denied planting evidence and framing the former minister, insisting officers had acted professionally during the midnight raid. The government has maintained the arrests and charges against Nazim demonstrate “no one is above the law,” and say it has no influence over the trial, claiming charges were initiated by an independent Prosecutor General and tried through an impartial judiciary. On February 24, Nazim filed civil charges against PG Muhthaz Muhsin, alleging the office had failed to protect the former minister’s constitutional rights. Nazim’s lawyers on February 12 filed defamation charges at the Civil Court and a complaint at the Police Integrity Commission against the Commissioner of Police Hussein Waheed for spreading false information. Waheed at a press conference following Nazim’s arrest said the police had found an improvised explosive device in a bag confiscated from his apartment. But lawyers say a police document detailing items confiscated from Nazim’s apartment right after the raid did not list an IED.